Feb. 21, 2011 - PRLog -- Though it has remained under the radar, Michigan's mobile technology industry has slowly but steadily been achieving growth over the last several years, in spite of the state's recent economic challenges. According to WirelessAdvisor.com, as of June 2010, over 4600 were employed within Michigan by the carriers providing wireless service in the state. Thousands more are employed in such areas as: mobile app and website development, mobile marketing, cell tower installation, and mobile technology management. Additionally thousands more are responsible for implementing mobile technology programs within a wide variety of industries including ad agencies, health care, manufacturing, retail, consumer services, automotive, travel, education, state services, tourism and more. And the need for staff in the mobile industry continues to grow. A local mobile expert, Keith Bourne of Appervasive states, "I recently spoke with a number of companies across southeast Michigan about their most urgent need for their businesses, the unanimous response was people to fill mobile-related positions in their companies. And these positions were not just in mobile development as you might expect, but instead they crossed the entire hiring spectrum including sales, marketing, accounting, and so on, in addition to development." Sevan Kulwicki, a representative from Southfield-based tier one technology staffing supplier Epitec Group, indicates that their clients have an ever-growing need for staff with mobile technology knowledge. She states, "Our clients depend on us to be in the forefront with regard to our ability to provide staff with mobile capabilities; for project management, development, and many other areas. We're always seeking ways to connect with members of the mobile technology industry." As the industry grows, so too does the need for a Michigan-based trade association focused on synergy and collaboration to insure continued growth of the industry and the career opportunities it provides - particularly within the State of Michigan - and to provide resources that enable that continued growth. To meet those needs, the Mobile Technology Association of Michigan (MTAM) has been formed as a non-profit trade association for Michigan's mobile technology industry. Those interested in joining MTAM may register on the organization's new website at http://GoMobileMichigan.org; this URL will direct visitors to the organization's PC website or mobile-optimized website depending on the device being used to access it. Each membership level receives all the General Membership Benefits, as well as those designated for their selected membership level; additional benefits to those listed are being negotiated with regional and national firms, and will be added on an on-going basis. Membership is open to students, individuals and firms working in, or interested in learning about or using, mobile/wireless technologies. If you want to learn how these technologies can be beneficial to your business, MTAM will be an essential factor to that education; if you’re in the industry, MTAM will provide a wide variety of valuable tools and resources to help you achieve growth. Founded by Linda Daichendt, CEO of Southfield-based Strategic Growth Concepts and Co-founder of Mobile Monday Michigan, the MTAM Board of Directors also includes: Cynthia Grubbs, Small Business Liaison with the Michigan Economic Development Corporation (Detroit/Lansing); Paul Czarnik, Chief Technology Officer at Compuware (Detroit); Keith Bourne, Founder of Appervasive and Co-founder of Mobile Monday Michigan (Ann Arbor); and Jonathan Engelsma, Professor at Grand Valley State University and Director of GVSU's Mobile Applications Lab (Grand Rapids). Several additional Board members are pending. The group's General Counsel is Mike Watza of Kitch Drutchas et al (Detroit). The organization is currently operating out of Southfield, but seeking permanent offices in downtown Detroit from which it will work to facilitate industry growth throughout Michigan. MTAM's new website was provided by High-Level Marketing of Farmington Hills, and the mobile-optimized version was provided by Keego Harbor-based, Fourstream USA. 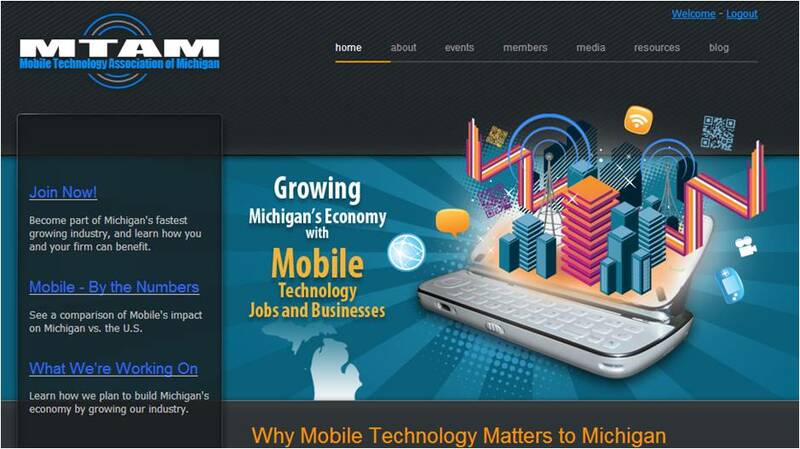 The Mobile Technology Association of Michigan (MTAM) is a Michigan-based trade association for the mobile industry. Our mission is to grow the industry within the state, thereby generating increased entrepreneurial opportunities and creating sustainable jobs. Our primary function: to foster cooperation between the various factions of the mobile industry and its professional associations globally, the State of Michigan, the investment community, the education community, and technology users to facilitate in-state growth of the industry. MTAM sponsors Michigan-based growth of the Mobile Monday organization; performs research for members and other interested parties; facilitates idea sharing, entrepreneurial programs, training programs and jobs creation; acts as a liaison with the mobile community inside/outside of Michigan; and serves as a resource for all things related to the Mobile / Wireless industry. The group's website can be found at http://GoMobileMichigan.org .